The A1 PLUS presents a perfect combination with tempered glass and sleek anodized aluminium. The square structure provides hassle-free installation, and the capacity to house powerful hardware. Prebuilt wireless charging station and InWin 650W 80 PLUS Gold PSU which offers continuous power for charging even when PC is off. Join InWin at CES 2019 (Las Vegas Convention Center, South Hall 1, Booth # 21330) where it is displaying its latest chassis’ including the 928 super tower, 905, Z-Tower, high-performance and efficient power supplies and modular air-cooling fans for PC enthusiasts. Using a hand-crafted construction method with the highest-quality materials, the Z-Tower’s unique design was inspired by architectural aesthetics. Its flowing, asymmetrical skeletal structure becomes the focal centerpiece of any room. Each is engraved with an individual serial number to highlight its limited status. The CROWN series is a ‘turbine inspired’ high static pressure fan (1.87mm H2O) that features nine clear blades. Available in both AC120 (120mm) and AC140 (140mm) sizes, the surrounding circular casing is tapered outwards at the edge to reduce noise, allows more airflow and provides a more attractive overall lighting effect. The corner mounting system incorporates four shockproof rubber pads to eliminate any vibration transfer to the chassis. Greetings Tech Enthusiasts! 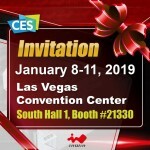 In Win Development (USA) Inc. requests an audience of tech buffs at the 2019 International Consumer Electronics Show (CES) at the Las Vegas Convention Center, South Hall 1, Booth #21330 from January 8– 11, 2019. Witness innovative technology merging with the art of design at the InWin booth. Come experience our products firsthand with our knowledgeable personnel that are more than willing to guide you amongst the showcase. For more CES information, please contact your account manager at (909) 348-0588. You are welcome to visit the In Win website www.in-win.com for more product information. Best regards, In Win Development (USA) Inc. Upgrading its critically acclaimed 100-series PC chassis, In Win Development Inc. (InWin) has today announced its new 103 ATX PC chassis. Available in white or black, the new 103 boasts a sharp new exterior pinstripe design expressed alongside subtle branding elements that include InWin’s iconic hexagonal ventilation patterns. The 3mm tempered glass side panel features tool-less entry and tastefully drapes over the new pinstripe aesthetic over the next corner. The new 307 introduces a never-before experienced concept: an array of fully customizable RGB LED front panel. The InWin exclusive GLOW software encourages users to create their own unique lighting effect. The CB series are available in two, ultra-high performance 1050W and 1250W models targeting high demanding PC setups such as workstations, enthusiast and high-performance gaming PCs with up to four high-end graphics cards using eight 6+2 PCI-E power connectors. Both CB models feature an 80 Plus Platinum rating, certifying its component selection and operation is of the highest quality. 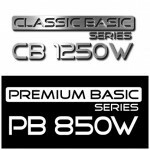 The PB series are available in 650W, 750W and 850W models, all featuring an 80 Plus Gold efficiency rating. Its large, 135mm fluid dynamic bearing fan is designed for long-life operation and features a smart fan control system that includes a semi-fanless mode, whereby below 20 percent PSU power output will shutoff the fan to eliminate noise. Providing 700W of power output, with a highly efficient 80 Plus Gold certification, the new CS-700W ( Compact Series) features one of the most powerful SFX power supplies available for consumer PC systems.